Dendrobium mohlianum sibling cross #2457 ('1194' x 'sibling') (approximately 25 seedlings per flask). The Species: The 7/8" wide flowers of this species appear over a long period between late winter and early summer. 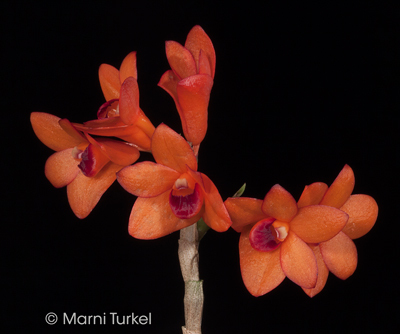 It comes from the South Pacific Islands where it grows as an epiphyte between 5000 ft to 8000ft elevation. The flowers are a waxy substance and a bright dark orange with a dark red lip for contrast. The leaves are an attractive, dark green and it stays a moderate size. The old leafless growths produce the flowers and will continue to bloom for several years. For many years I grew one plant of this species and it flowered occassionally with 1 or 2 flowers at a time. Not very impressive. A while back a friend gave me a couple of seedlings from a cross he had made and they changed my mind about Dendrobium mohlianum. These not only bloom quite frequently, but they have multiple flowers per growth making it a rewarding and showy species. Culture: It grows in intermediate to cool-intermediate conditions with moderate light. For most of the year it is watered as it approaches dryness (once a day for a mounted plants, less often for potted). I give it good humidity and air movement. A slightly lessening of water in the winter is suggested, but doesn't seem to be necessry. I've never tried a hard dry rest. Besides mounted, I have also grown this species successfully in a net pot in both straight moss or in a plastic pot in fine bark mix.